DIDCOT TOWN FC was formed in 1907. They spent much of their early years in local leagues, such as the North Berks and Reading Leagues. They joined the Hellenic League in 1953 and apart from a few years break in the Metropolitan League, they remained there up until 2006 when they won the title. They had spent most of their time in the Premier Division but had sent a number of short spells in Division 1, most recently in the mid '90s. 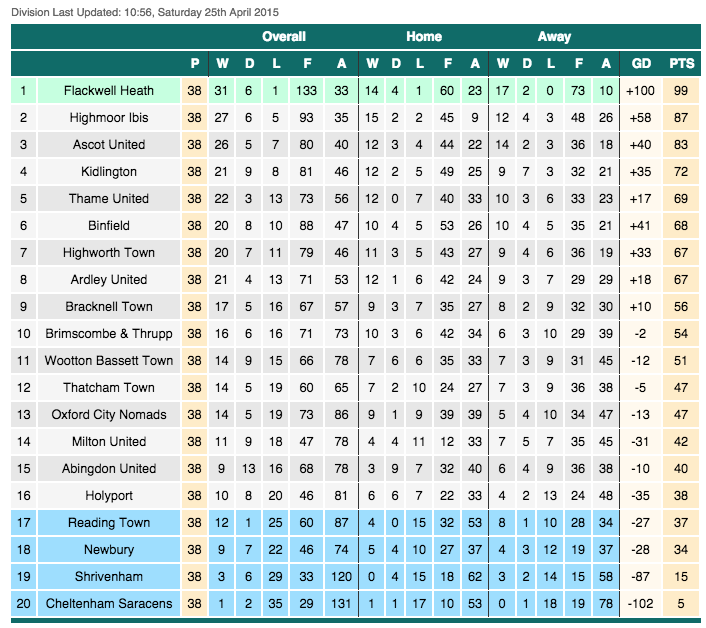 Promotion from the Hellenic earned them a place in the Southern League Division 1 South & West. 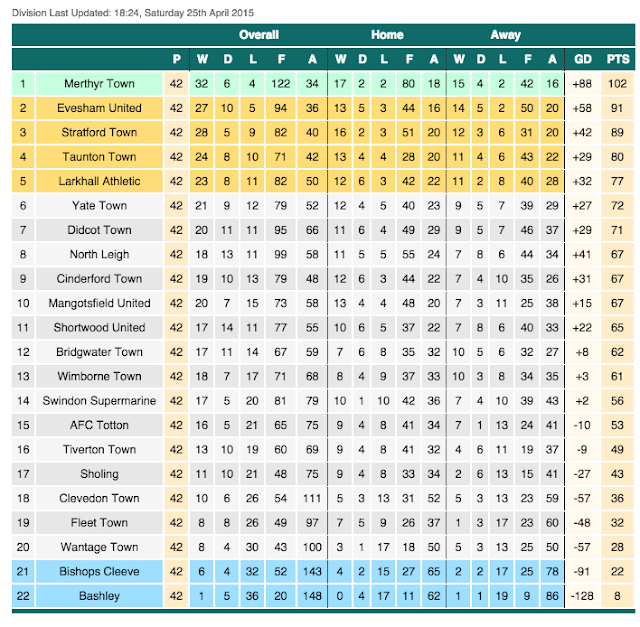 In their 3rd season, they won the playoff final against Totton after finishing 5th They spent 2 seasons in the Southern Premier, being relegated and returning to D1 South and West in 2012. They struggled for the first few seasons, but last season was a marked improvement with a 7th place finish, not far from a shot at returning to the Southern Premier through the playoffs. The clubs finest hour was winning the FA Vase in 2005. With future Wycombe striker Stuart Beavon in attack, they beat AFC Sudbury in the final at Tottenham Hotspur. They had to win 9 games in that final, including the likes of Gosport Borough & Bury Town who have gone on to much better things. They had their joint best FA Trophy run last season, beating title winners Merthyr Town before taking Forest Green Rovers to a 1st Round Replay. The FA Cup 4th Qualifying Round was reached in 2012/13 but it was a bit of an anti-climax as they lost 1-0 at home to Arlesey Town, losing out on a plum tie against Coventry City in the process. Wycombe’s last chance of cup glory this season came on this night, albeit the Reserve team. A young Wycombe side travelled to the N-Power Loop Meadow ground, home of Didcot Town. The hosts, going well in the BGB Division 1 South & West featured former Wycombe youth team player Josh Mulvaney and were sure to provide a decent test for Wycombe. Wycombe, the winners of the Bucks & Berks Cup a record 26 times welcomed back Mike Williamson after a lengthy injury lay-off, Jamie Young also getting back his match fitness playing in goal. Others on the fringes of the first team that played were Sam Stockley, Chris Palmer, Andre Boucaud & George Daly. On a cold night, an uneventful game was won by the head of Tom Cadmore. The young defender was in the right place at the right time, to connect with an excellent Chris Palmer cross. Palmer, the man of the match by a long chalk looked dangerous all night and Wycombe should have had more. A trip to Milton Keynes is Wycombe’s reward, who are now just one game away from their 4th consecutive final. The winners of the Windsor & Eton V Chesham Semi Final will play whoever comes out on top in our semi-final. 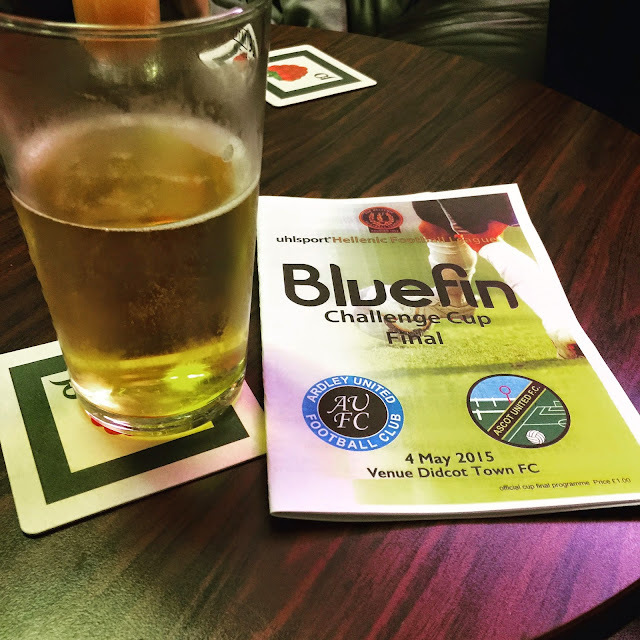 With not much else on the Bank Holiday Monday, and with fellow hopper Anwar yet to visit Didcot, I suggested to him that we go to the Bluefin Cup Final at Loop Meadow. I was happy to do this as I was yet to pick up a programme from this venue, having not been bothered about them before I started groundhopping. Ardley United were a team I had seen in pre season as they drew 1-1 with Oxford City in a highly entertaining game. 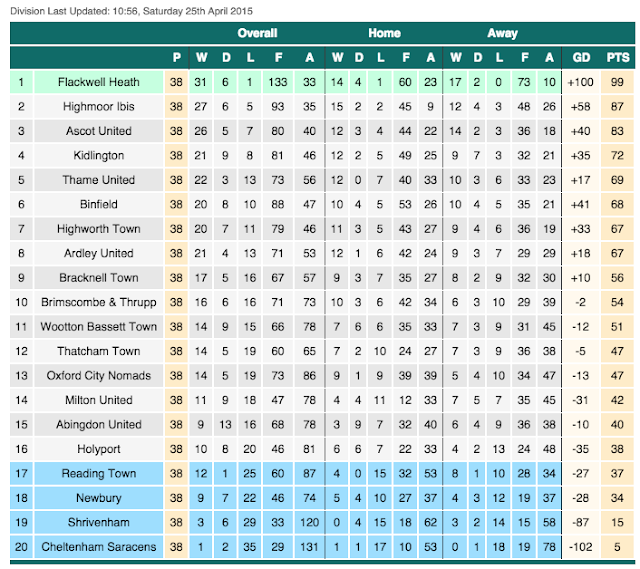 They were unlucky not to win and the season that followed produced a decent 8th placed finish in the Hellenic Premier. To reach this final they had won 2-1 at basement club Cheltenham Saracens, won 6-1 at Chinnor, beaten Holyport 3-1 before triumphing 6-3 in a goalfest at Thatcham Town. They had beaten the reserves of North Leigh 1-0 in the quarters before winning 2-1 at Division 1 East side Rayners Lane to set up this game. I'd seen Ascot United twice at near the end of 2014. Firstly on their home ground when they beat Milton United 3-2 on a Tuesday evening and then on a Saturday just before Christmas as they triumphed 2-0 at Newbury. They had enjoyed an excellent season, reaching the latter stages of the FA Vase and finishing 3rd in the Hellenic Premier. They had reached this final with a 5-2 win away at Penn & Tylers Green, a 1-0 win then they hosted Wokingham & Emmbrook, a 3-1 win over Holyport, a 1-0 win at Longlevens before beating title winners Flackwell Heath 1-0 in the semi final. I'd had to work the Bank Holiday as part of my contract at work - it was one of the 2 that I had volunteered to do. Usually Monday is a complete pig of a day at work, but on this occasions it was not so bad. I had taken my break and done all my work by 12.30. I then spent the nest 20 minutes getting changed and having lunch before leaving at 12.50. I was in Aylesbury by 1.25 to meet Anwar and his 2 kids - Hicham & Aisha. It was not too far to Didcot, but thanks to a few dawdling drivers, we took a few minutes longer than I would have liked, arriving an hour later. As there was still plenty of time to kick off, I grabbed a programme from the turnstile before going into the bar for a pint of Thatchers Gold while checking my phone for Facebook updates. We went in 15 minutes before kick off, and I noticed that there were 3 new stands behind the right-hand goal since my last visit, with the middle one being a work in progress. The game was not much to write home about. Though Ascot had much the better of the opening and closing stages, the bit in the middle was pretty sterile. It was won by 2 excellent goals though. Firstly Kieran Scott finished into the bottom right-hand corner after a smart bit of team play after a quarter of an hour. Then on 65 minutes, Luke Ingram scored a great individual goal, chipping the ball up before half-volleying into the top hand corner. 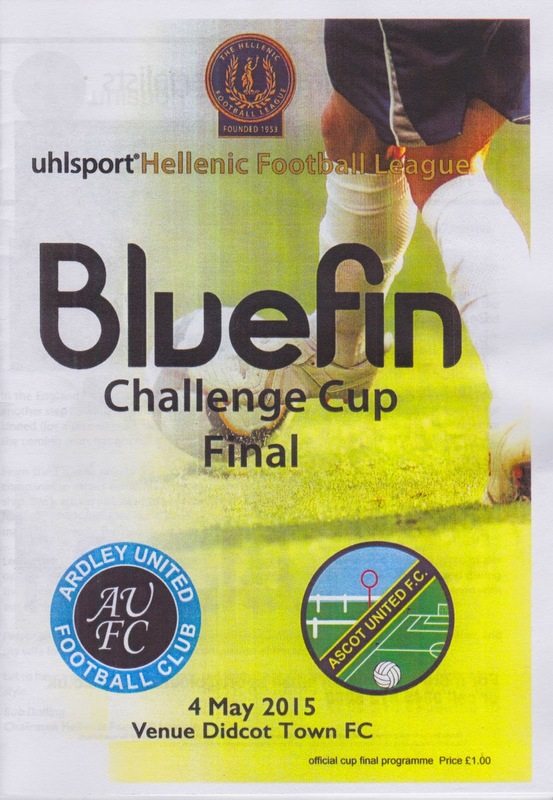 That was enough to win the cup for Ardley United, which was a repeat of last years final, albeit with different winners. We watched the cup being presented before going on the hill behind the ground to get some pictures of the ground before letting the kids play in the local park for a bit. We left at 5.25, and the journey home was a lot better, with us back in Aylesbury at 6.10 and me getting home 20 minutes later. LOOP MEADOW is a smart modern non-league ground, the main feature being the impressive main stand, I initially visited Didcot on the way to an Abingdon Town game and they were most helpful in letting me into the ground to take pictures. The original stand holds around 200 and since my first visits there had been a couple of metal 'Arena' stands added to up the seating capacity by around 150. There was also some covered terracing in the progress of being built. The rest of the ground is open with a capacity of around 3000. The clubhouse was smart and modern too, well worth a visit. It's full of great memorabilia including signed shirts. There is a good range of drinks at reasonable prices as well. There was no club shop that I saw, but there is a tea bar in the ground, selling a range of items at higher than average prices for this level. There are some shops near the ground, including a chippy when I went in 2008, though I am not sure if it's still there now. 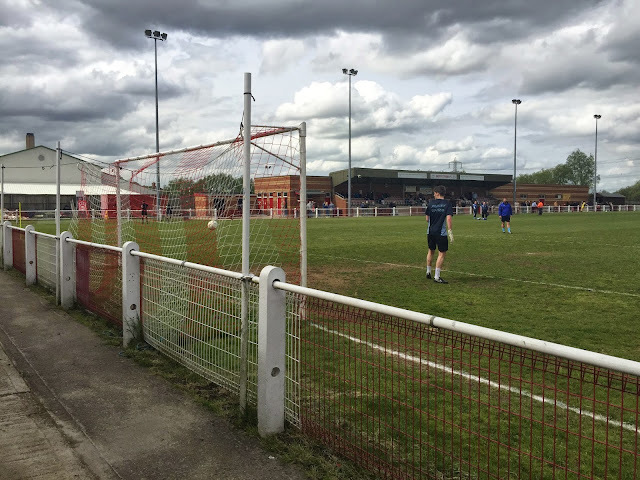 There is also a second pitch at the back of the ground, this is floodlit and hosts some of their reserve & youth team games, as well as being the former home of North Berks League outfit Didcot Casuals. It will also be used for the North Berkshire League Hop next season as Hagbourne United use it to host the evening game on Saturday.